For the second time — the first was in 2008 — Burlington City Arts is thrilled to receive a substantial grant from the New York City-based Andy Warhol Foundation for the Visual Arts. The grant, for $100,000 over two years, is intended to support the creation and exhibition of new artwork, according to BCA communication director Eric Ford. "It's for exhibition-specific work," he says. "Artists will make work here and then show it." Receiving such an award twice from AWF, he adds, is "unprecedented in Vermont." The Foundation does not otherwise put any restrictions or parameters on what BCA does with the funding. "The grant is really open ended," says Ford, calling it "very freeing" and a rare opportunity. "It really gets back to the importance of contemporary art, to making it and showing it in Vermont." Ford credits BCA curator DJ Hellerman's vision for winning the grant. Next steps will involve finding ways, and places, for selected artists to work. The fourth floor of the BCA Center, formerly a space for artists-in-residence, was transformed into the Vermont Metro Gallery more than a year ago. Ford reveals that one site will likely be in quarters the city already owns, but has not yet renovated, on Pine Street (current studio artists elsewhere in the building do not have to move, he clarifies). In addition, BCA is planning artist residencies in state parks during this year's "Of Land and Local" multi-location exhibit. Ford says more information and RFPs will soon be announced. 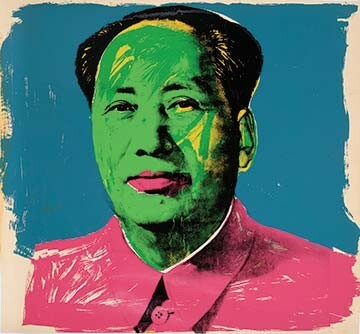 BCA's news comes on the heels of Middlebury College Museum of Art receiving a donation of 10 Warhol prints from the Foundation, including the pictured portrait of Chairman Mao Zedong. Those works are on exhibit now through April 19. By coincidence, the Montréal Museum of Fine Arts is currently hosting "Warhol Mania," an exhibition of the artist's early illustration work for magazines and posters and celebrity portraits. That's further validation of New York Times writer Ted Loos' forecast of 40 new exhibitions — including Midd's — this year of Warhol's seemingly endless supply of work. The title of his January 4 article? "For Warhol, ’15 Brings More Fame." It has to be said, the late artist's Foundation also seems to have an endless supply of generosity.